My brother Dave had restored a few cars recently and had gotten quite good at it. He told me he'd redo the car for me if I paid for supplies. With that offer, I had to buy the car. I remember driving the Charger home the day I bought it and noticing how huge the car seemed compared to the Gremlin. It also had a little more pep. When I got home it went in the family garage where just a few years earlier another brother had rebuilt a Hemi . Dave and I went to the paint supply store and bought materials. Bondo was high on the list since the bottoms of the rear quarters were long gone. And we weren't going to repaint it green. 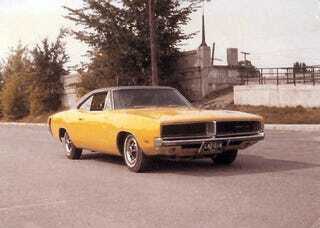 The car we had thought of when seeing it was the yellow Charger from Dirty Mary, Crazy Larry. If you have not seen the movie, I highly recommend it. It's not high art but it is one of the greatest car chase movies ever made. It's got some people in it who yammer on about stuff but you can turn the sound off when that happens. Steve Lehto is a writer and attorney from Michigan. He wrote Bobby Isaac: NASCAR's First Modern Champion. He also wrote Chrysler's Turbine Car: The Rise and Fall of Detroit's Coolest Creation and The Great American Jet Pack: The Quest for the Ultimate Individual Lift Device.